Be the first to share your favorite memory, photo or story of Carter Riley. This memorial page is dedicated for family, friends and future generations to celebrate the life of their loved one. 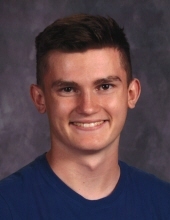 Carter Riley Matousek, age 16 of Cassville, WI, passed away on Sunday, April 7, 2019. He was born in Prairie du Chien on May 1, 2002 the son of Mike Matousek and Christy Mumm. Carter attended Cassville High School and was active in many sports. He liked to hunt, fish and trap, and learned many lessons from his grandpas, Gary and Dave. Carter enjoyed playing video games, baseball, and he loved basketball. He often helped cut and stack firewood, not because he liked it, but because Carter took any chance he could to spend time with his family. Carter’s heart was not big, it was huge – he genuinely cared about people and will be long remembered for his love for others. Carter is survived by his mother, Christy (Jerry) Mumm; his father, Mike (Cindy Gerner) Matousek; sisters: Lauryn Matousek and Kenzie Peet; brothers: Landon Krantz, Josh and Jordan Mumm; grandparents: Carol Moore, Nancy (Gary) Thurn, Tom (Ingrid) Matousek, and Gerry Mumm; great-grandmothers: June Rice and Patricia Weaver; aunts and uncles: Craig (Tioni) Krantz, Dan (Amanda) Moore, Doug (Ashley) Moore, Arran Krantz, Connie Moore, Al (Judy) Mumm, Jim (Sue) Mumm, Dan (Deanna) Mumm, Dean (Jenny) Mumm, Pete (Lisa) Mumm, Brian Matousek, and Matthew Matousek; and many cousins. Carter was preceded in death by his grandfathers: Dave Moore, Ambrose Mumm, and Joe Krantz; his great-grandfather, Ron Rice; great-grandmother, Goldie Clanton; and uncle Richard Rice. Funeral services will be held at 11:30 a.m. on Saturday, April 13, 2019 at St. Mary’s Catholic Church in Bloomington, WI, with Pastor Mary Ann Floerke officiating. Burial will be in Hermitage Cemetery, Mt. Hope Township. Visitation will be held on Saturday, April 13, 2019 from 8:30 a.m. until the time of service at the church. In lieu of plants and flowers a Carter Riley Matousek Memorial Fund has been established. Martin Schwartz Funeral Home & Crematory in Cassville is entrusted with his services. To plant a tree in memory of Carter Riley Matousek, please visit our Tribute Store. "Email Address" would like to share the life celebration of Carter Riley Matousek. Click on the "link" to go to share a favorite memory or leave a condolence message for the family.